Can anyone share some information on Princess Eugenie of Sweden, such as why she never married and maybe have some pics of her to post. The picture has been on-line for sale recently. A rare image I guess. Princess Eugénie (her official Swedish name was Eugenia) was born 1830 and died 1889. 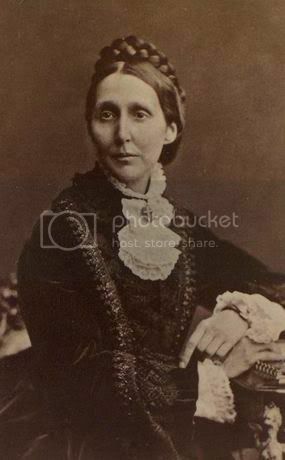 She was the fourth child and only daughter of king Oscar I and his wife Josephine, née princess of Leuchtenberg (at the time of her birth Oscar and Josephine were still crown prince and -princess, though). From her early teenage years Eugénie suffered from bad health. She had weak lungs (there are theories about tuberculosis). There could be several reasons to why she never married, her weak health being one of them. It is also said that she didn't wish to get married. Also, the Bernadottes were at this time still regarded as a "new" dynasty, and they were not popular "marriage candidates". 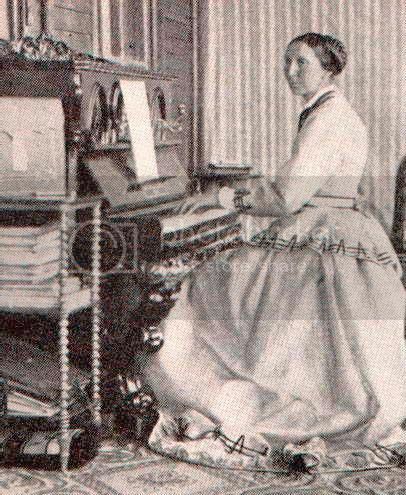 Princess Eugénie had artistic talents, she was a very good drawer and also worked with composing and sculpturing. She was also involved in charity. Eugeniahemmet (literary translated "The Eugenia home") was founded 1879 and was an institution for ill and handicapped children in need of care, food and clothes and somewhere to live. It survived until 1971, when it was closed. There is a most charming picture of princess Eugénie with her nephews in a book that I have, but unfortunately I don't have a scanner. Hopefully you've had some help from this info. From her early teenage years Eugénie suffered from bad health. She had weak lungs (there are theories about tuberculosis). She does look like she has a bad health. 2 more pics of Eugenie, with thanks to Mardam! Danjel, the second one of the pictures you posted is the one I was talking about in a previous post on this topic. It's in a book called Alla dessa Bernadottar (which translated into English would be something like All these Bernadottes) written by Staffan Skott. I think it's a charming picture, and thank you very much for posting it. The boys are her nephews (sons of king Oscar II). 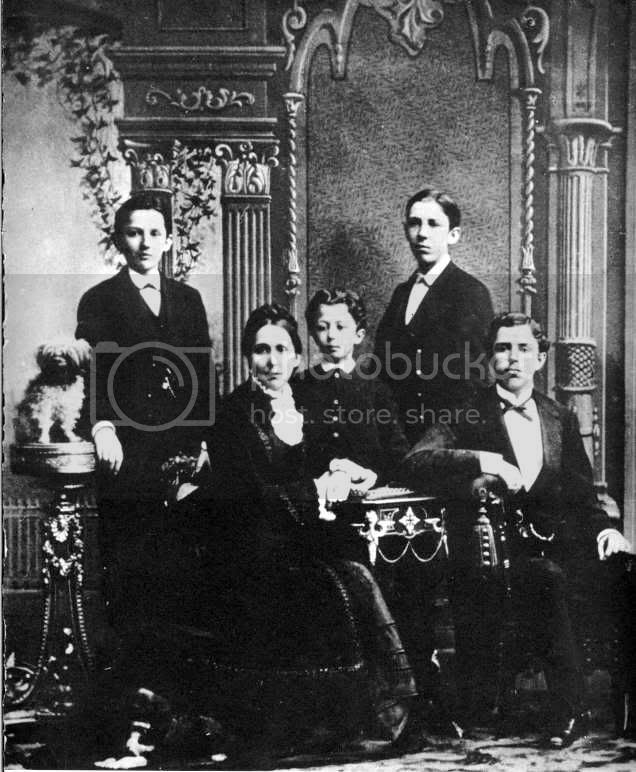 From left to right: prince Carl, princess Eugénie, prince Eugen, prince Oscar and prince Gustaf (the future king Gustaf V). Hello! I´m searching info about Josephine Maximilienne Eugénie Napoléonne, elder daughter of Eugène of Beauharnais and his wife Amalie Auguste princess of Bavaria. I became curious about a question: did she know her paternal grand-mother, empress Josephine? I know that little Josephine was seven years old when old Josephine was died, but I really want to know if the empress had the chance to share a part of time with her grand-daughter. 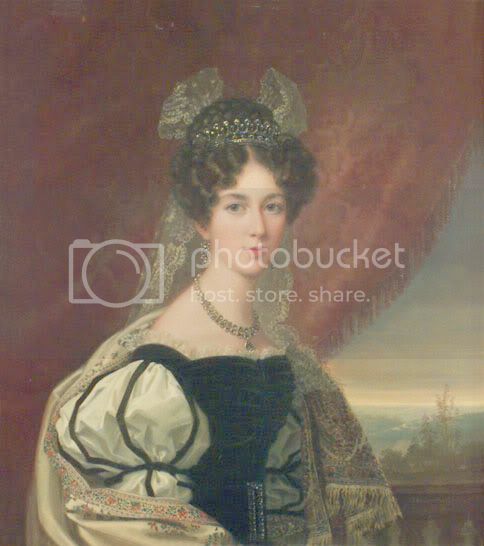 I just have seen a portrait of Josephine of Leuchtenberg and I wish to have more pictures. 14 march, Milano : birth of Joséphine, first daughter of Eugène & Auguste-Amélie. & later - by wedding Reine de Suède. 4 march-17 july : journey of Eugène in France for the birth of the son of Napoléon & Marie-Louise. Eugène becomes heir of the Royaume d'Italie IF NAPOLEON HAS NOT A SECOND SON. 9 may-24 june, Eugène is in Paris and Malmaison. Empress Joséphine dies the 29th of May. Could we immagine that during no one of these journeys the little girl was with her parents or with her father ? If I found something more precise, I will tell it to you. Thank you a lot for your valuable info and the paintings of Eugène and his wife Amalie, a wonderful couple! It´s very kind of you, Canard. And, about your english, you don´t need to apologize...I´m sure that your english is better than mine, since I´m spanish and I have learnt french, not english, at my schooldays! I´m interesting about Josephine of Leuchtenberg because I find very amusing the fact that she married a son of Dèsirée Clary. It is funny the way things go...a grand-daughter of Josephine of Beauharnais marrying a son of Dèsirée! And I know that Josephine knew well her mother-in-law, by the time queen Desideria, but I´m interesting about relationship between Josephine and her paternal granny and her paternal aunt Hortense. I do not know if you knew in what way Hortense lived before and after the fall of the empire; SHE HAD A VERY COMPLICATE LIFE. After she leaved Louis,she live for a while in Paris but she became pregnant of Flahaut and she needed to leave Paris. Eugène - father of little Joséphine, helped her and she returned to Paris. ( the baby was the future Duc de Morny, powerful during second empire...) First Empire falled and her mother died. At the beginning she was far from Napoléon, but when N. returned from Elba island, Hortense turned to him and after the second fall, she begun a very difficult life in exile (Czar and french king do not wanted her in France with her sons) So the situation was rather hard, but Eugène helped her, obtaining from his Father in law, king of Bavaria the possibility for Hortense to live in Augsbourg, not far from Munich were he lived with his family. She bought Arenenberg Castle in Switzerland but only for a summer residence. When Eugène died, she leaved Augsbourg and lived mainly in Arenenberg. Prince Frans Gustaf Oscar of Sweden and Norway, Duke of Uppland was second son of King Oscar I of Sweden and Norway and Queen Josephine, nee of Leuchtenberg. He was born on June 18 1827 in Haga, Stockholm and died on September 24 1852 in Kristiana, now Oslo. I know that he was a composer and that is it. What was his relationship with his elder brother, as he was the next in line after him? Better than relationship between Karl and Oscar? Why did he die so young, was he ill? And is perhaps known if he was planed to be married to any royal/noble woman? I know I have a lot of questions, but I don't think that he was discussed on this MB, so please anything would be great! Prince Gustav was both the favourite of his mother and his sister. He seemed to go on well with his rather problemtic brother Karl (unlike his father) and while studing in Uppsala they shared a house, where they enjoyed entertaining their fellow students. Due to King Oskar´s health, he went to Bad Kissingen in the summer of 1852 to take a cure. He was accompanied by his wife Josephine, his son Gustav and his daughter Eugenie. While Oskar´s health became better, poor Gustav became sick. After their stay in Bavaria, the Royal Family went to Kristiania, where it was discovered that Giustaf had typhoid. He died within days after their arrival in Kristiania in the arms of his mother. I have not heared of any possible marriage plans, but one never knows. You said that Gustaf and Karl enjoyed entertaining their fellow students; how? What did they do? Well, when they got home from the university, Karl used to command that everybody should to lie down on his and Gustav´s beds and relax, sing etc. Rather strange, hein? But Gustav also liked to play the piano, best four-handed. Lie down on their beds, relax and sind and... perhaps something else? Can you tell me if Karl was faithfull to his wife? What was Gustaf's opinion on Louise? Was he friendly with her? Oh, gosh now I see that three Josephine's sons died before her? It must have been hard on her? P.S. : Is there some other image of Gustaf, beside the one I've posted?